During my stay in Luang Prabang, I kept hearing about a place, again and again. An unmissable. A place I had to see, Kuang Si Falls. “Daaaaaamn I visited Kuang Si Falls yesterday, it was wonderful! Man, just go, you’re gonna love it, it’s sooo beautiful!” Not just travelers, the manager of my hostel also told me it would be a shame not to go, a waiter in a bar said the same thing, a girl at the gym… All right all right, let’s see those Kuang Si Falls. I have to admit I’m a bit skeptical when so many people praise a place so much. To me, it screams tourist trap, a place packed with people elbowing each other to take the perfect picture… But anyway, at the same time, it would be a shame to miss Kuang Si Falls just because I’m acting like a purist avoiding the other tourists (although I’m one of them…). And who knows, maybe the Kuang Si Falls are not that bad! Here I am, leaving Luang Prabang early in the morning (to avoid the crowd), heading to the Kuang Si Falls, located 22 kilometers (13.5 miles) south of Luang Prabang. I went there by tuktuk and I didn’t regret it at all. The road is very bumpy and from the tuktuk, I could see other travelers struggling with their bicycles or scooters. We finally made it there and the first thing we saw was not a beautiful waterfall but… a black bear sanctuary! Indeed, black bears are endangered animals, and on the initiative of a group of Australians, a center of rescue and recovery of bears was created (Tat Kuang Si Rescue Centre). You can see the bears play with each other, climb the trees, drink water. The main purpose of this center is just to protect those bears, who are the target of poachers, but also to protect them from the Chinese medicine : they use their bile. Visitors who want to support the cause of black bears can buy souvenirs at the stands next to the rescue center. After the bears, we had to walk for a few minutes, before catching sight of the first pools of the Kuang Si Falls. According to the legend, a long time ago, an old man summoned the water by digging into the earth. A golden deer made its home under a rock protruding from under the waters. Hence the name Kuang Si Falls. Kuang means deer and Si means to dig. Just to explain you how the Kuang Si Falls are organized, there are actually several pools. You follow a path and you pass by various pools. The first ones are pools where the water is shallow, and the water comes from a low height. But if you keep walking, you’ll notice that the next pools are bigger, and the water comes from higher. Finally, the last pool is the most impressive. This is where you’ll see the biggest waterfall, and the water falls from a height of 60 meters (200 feet). For your information, it’s possible to swim in some of the pools but not all of them (there’s a sign when it’s not possible). Therefore many visitors enjoy the pools and take a dip in the water but be careful, the water is cold! Otherwise you’ll see several paths around the waterfalls, a picnic area and a few restaurants there (with touristy prices). Before entering the Kuang Si Falls, you’ll see some stalls selling good and cheap Asian food. I spent a few hours at the Kuang Si Falls and time went by so fast. Indeed, this place is splendid, and it’s hard to describe with accuracy the beauty of those waterfalls. An unmissable if you go to the north of Laos. Wanna go to the Kuang Si Falls? From Luang Prabang, the best way to go there is by tuktuk. Ask your hotel the day before and the D-day, a tuktuk will pick you up, drive you there, and drive you back to Luang Prabang from the Kuang Si Falls a few hours later. The two-way trip costs between 40 and 50000 kips (4 to 5 euros), depending on the time you want to go. It’s a 45-minutes ride. Otherwise you can rent a bicycle (20000 kips per day, 2 euros), or a scooter (100000 kips, 10 euros). But if you rent a bicycle, don’t forget you’ll have to cycle for more than 40 kilometers (25 miles) for the two way trip. And either by bicycle or by scooter, the road is in very poor condition, accidents are frequent… I said it before, but don’t forget to get a travel insurance! The entrance fee is 20000 kips (2 euros), and the Kuang Si Falls are open from 8am to 5:30pm everyday. 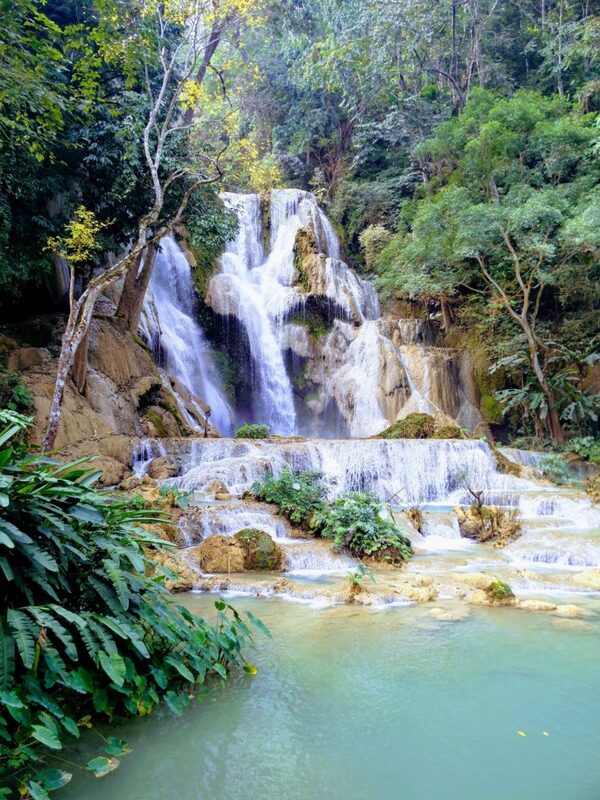 The best time to go to the Kuang Si Falls? Before 11am, but not on Sundays (that day, many Laotians go there!). Don’t forget to take a towel and a swimming trunk if you wanna swim in the pools.